Every time Borussia Dortmund and Borussia Mönchengladbach go head-to-head, many people predict a high scoring, pulsating and entertaining game. Here’s a look back to five of the most memorable matches between these two sides. With both sides entering the game without a few of their star players, both teams acknowledged that this wasn’t an easy game and most of all, neither one of them could afford to lose. The first goal of this nerve-racking game came via Borussia Mönchengladbach’s left-back: Oscar Wendt scored the fastest goal of the Bundesliga season, meaning that Klopp and his team were off to a nightmare start. Die Fohlen were on top; this time, unsurprisingly, they increased their lead after a sensational counterattack from the hosts led to Brazilian Raffael scoring, with the Borussia Dortmund goalkeeper – Weidenfeller – nowhere in sight. A Christoph Kramer own goal ensured that Borussia Dortmund would take all three points. To put in simple words, this was a much needed win for Borussia Dortmund and additionally, some may argue that it was a morale boosting victory, too. Throughout the game, Borussia Dortmund were dominating possession and the more likely side to score the first goal. Former Die Fohlen star Marco Reus went close twice, but goalkeeper Sommer did really well keeping the German international out both times. Nonetheless, a tragic moment came for Borussia Mönchengladbach’s Kramer when he scored an own goal by lobbing his own goalkeeper from near the half way line. This derby must surely be remembered, mainly due to this nightmare own goal. Marco Reus had a day to remember, but for his former club – Borussia Mönchengladbach – it was a day to forget. An inspired performance from the German was the key for Borussia Dortmund, as they convincingly thrashed their rivals by five goals to nil. As the first half progressed, Borussia Dortmund were looking likely to score, having dominated most of the possession; with ten minutes remaining before the referee blew the whistle to end the first half, it was the hosts who struck first thanks a glamorous goal: Reus picked up the ball and easily danced around the defence of Die Fohlen to slot the ball past goalkeeper Marc Andre ter Stegen. The interval was minutes away when Subotić doubled his side’s lead – he rose higher than anyone else to calmly guide the ball past ter Stegen. This second goal made Klopp’s half-time talk a lot easier. In the early stages of the second half, Borussia Mönchengladbach started brightly and they had a couple of good opportunities to score, but Roman Weidenfeller made sure that his side kept their two goal lead. Nevertheless, despite the visitors’ decent start to the second half, Marco Reus added a third for Dortmund, his second of the game. The German appeared to have squandered the ball in his first attempt but his reaction and vision meant that he would quickly score the second time round. The day for Klopp and his side was rapidly reshaping from good to spectacular – Gündoğan’s goal from close range and Błaszczykowski’s goal towards the end of the match ensured a massive three points for the hosts. The scoreline mirrored Borussia Dortmund’s performance and showed the sort of problems Gladbach were facing in their defence at the time. Borussia Dortmund continued to lead the Bundesliga table with a breathtaking comeback and display against Borussia Mönchengladbach. The Borussen derby was the perfect epitome of attacking football whilst Borussia Mönchengladbach once again were shambolic in defence. Undoubtedly, Borussia Mönchengladbach had the ability to beat the bigger teams in Germany and it was quite evident when Marco Reus scored the first goal of the derby – the German fired the rock bottom side ahead just after the half-an-hour mark. Reus’s goal meant that Klopp’s Dortmund found themselves trailing for the second week running. Howbeit, Serbian defender Subotić netted a crucial equaliser for the league leaders on the stroke of half-time. Moreover, in the second half, Borussia Dortmund impressed and they deservedly went ahead: Kagawa gloriously latched onto Götze’s ball before rounding the goalkeeper and nicely tapping the ball into the empty net. Furthermore, a superb backheel from Argentine forward Barrios to Großkreutz made it 3-1, and in the latter stages of the second half, Barrios added his side’s fourth to make the scoreline read 4-1 to Borussia Dortmund. To some, Borussia Mönchengladbach’s twelve nil win would come as a shock. It was the final matchday of the 1977-78 Bundesliga season; the hosts entered the game with Borussia Dortmund as reigning Bundesliga champions of the previous season. I could sit here all year talking about this horrendous defeat for Borussia Dortmund, but it is still possible to cut down the whole story into one little paragraph. 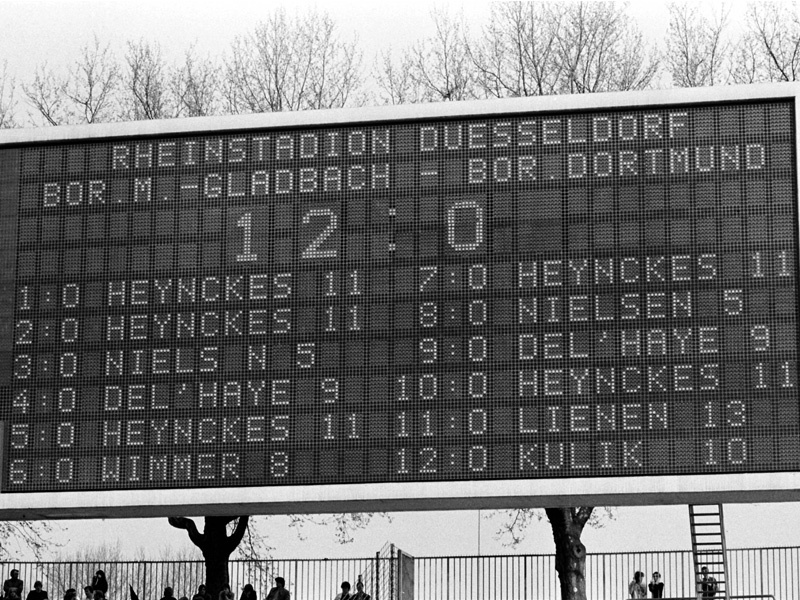 As soon as the game started, Jupp Heynckes gave the home side the lead after just one minute. By the half-hour mark in the game, Borussia Mönchengladbach were already five nil up; Heynckes scored his second of the game, too. Moreover, by half-time, it was six nil to hosts. In the second half, Mönchengladbach’s flurry of shots on goal didn’t stop. Heynckes and Carsten Nielsen had made it 8–0 by the hour mark. By the end of the game, Borussia Mönchengladbach won 12-0 and it instantly raised concerns and questions over the futures of the Borussia Dortmund players and most importantly, whether this game involved some sort of match fixing – until this day, no one knows the true behind the scenes story, but all we know is that Borussia Mönchengladbach enjoyed a very hollow victory, as even this massive win couldn’t see them go past Köln in the Bundesliga table on the final match day of the season. Both sides finished on the same amount of points that year, but despite The Foals massive win Köln still won the league because of their superior goal difference. Season Preview – Borussia Mönchengladbach – Can Favre deliver more success after spending spree?